A Russian Soyuz rocket launched an unmanned cargo freighter to the International Space Station Monday (Feb. 11) to deliver nearly 3 tons of fresh food, water and equipment to the six men living on the orbiting outpost. 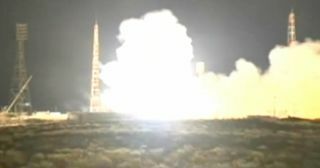 The robotic Progress 50 resupply ship and its Soyuz rocket lifted off at 9:41 a.m. EST (1441 GMT) from the Central Asian spaceport of Baikonur Cosmodrome, where it was late evening local time at the time of launch. The Progress 50 cargo ship is flying on an accelerated schedule that will deliver it to the International Space Station in six hours, instead of the two days the unmanned cargo trips have traditionally taken for much of the space station's 13 years of crewed operation. Progress 50 is expected to arrive at the space station at 3:40 p.m. EST (2040 GMT) and park itself at a Russian docking port. You can watch the Progress 50 dock live on SPACE.com here, beginning at 3 p.m. EST (2000 GMT), courtesy of NASA's television feed. Prior to the space docking, you can watch NASA launch the new Landsat Earth-observation satellite live at 1:02 p.m. EST (1802 GMT). The webcast for that launch begins at 10 a.m. EST (1500 GMT). Progress 50, meanwhile, is delivering about 764 pounds (346 kilograms) of propellant, 110 pounds (50 kg) of oxygen and air, 926 pounds (420 kg) of water and about 3,000 pounds (1,360 kg) of spare parts, science gear and other supplies, according to a NASA description. The Russian Federal Space Agency's Progress spacecraft are disposable vehicles similar in design to its three-segment Soyuz crew capsules, but with a propellant module in place of the central crew return capsule on the Soyuz. Progress vehicles are designed to be disposable and are intentionally destroyed by burning up in Earth's atmosphere at the end of their mission. Robotic resupply ships for the station built by Europe and Japan are also disposed of in the same way. The only robotic supply ship for the space station that can return supplies back to Earth is the Dragon space capsule built by the private spaceflight company SpaceX. Dragon space capsules visited the space station twice in 2012, with the next one slated to launch from Florida atop SpaceX's Falcon 9 rocket in March. Dragon vehicles are equipped with a heat shield to protect them during re-entry and are built for ocean splashdown landings in order to return experiments and other gear to Earth.